New Delhi: International Management Institute (IMI), New Delhi, the best private B-school in India by NIRF 2016, MHRD, conducted its 33rd Annual Convocation Ceremony on April 22, 2017 at IMI-New Delhi campus. During the ceremony, 299 students of the premier Business School were awarded their diplomas. Attended by several notable guests and luminaries, the event was also graced by Shri Onkar Singh Kanwar, Chairman and Managing Director, Apollo Tyres Ltd., who was also the chief guest of the event and Dr D H Pai Panandiker, Senior Member- Board of Governors – IMI New Delhi and President – RPG Foundation, Chairman-International Life Sciences Institute-India and Advisor – Confederation of Asia-Pacific Chambers of Commerce and Industry. 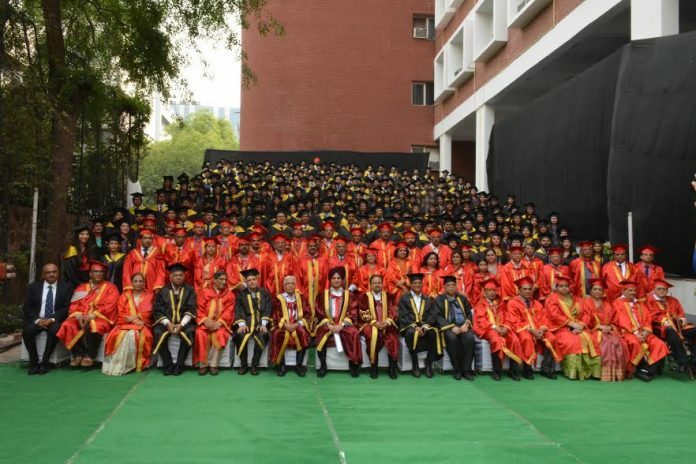 The ceremony saw 102 young women and 197 men graduating with their hard-earned diplomas including 9 gold medalists – 4 for academic and 5 for Scholastic/other achievements across programmes including PGDM, PGDM(HRM), PGDM(B&FS), Executive PGDM and FPM. In his welcome note, the chairperson of the convocation, Dr D H Pai Panandiker, Senior Member- Board of Governors – IMI New Delhi and President – RPG Foundation, Chairman-International Life Sciences Institute-India and Advisor – Confederation of Asia-Pacific Chambers of Commerce and Industry shared, “On this convocation of IMI, I would like to congratulate the Alumni on completing their programmes and for receiving their diplomas”. “The expected GDP growth of India i.e. 7.5% will contrast with the GDP growth of other countries and thus, the opportunities here will be plenty and job generation will be high. I would like to encourage the students to look at job opportunities but also to new businesses that they can set up. The government has provided incentives for start-ups, so business is a new option which we should be looking at”, added Dr. D H Pai Panandiker while talking about the expected GDP rate for 2017-18 and considering new businesses as a career option. Dr. D H Pai Panandiker also conferred the awards to the students. On the occasion, Dr. Debashis Chatterjee, Director General- IMI-New Delhi, said, “I would like to congratulate all the students for having successfully completed, perhaps the most intense period of education in their academic career so far. We believe that our students will be the future thought leaders of the society. “As an integrated business school, we are investing significantly in our knowledgeable and physical structure. We aspire to be a global management school and actively have student exchange program with some of the leading European business schools. In the next academic year, we expect the student exchange figure to increase significantly and are currently seeking collaborations with more business schools across different geographies for joint research, executive training, faculty and student exchange program”, concluded Dr. Debashis Chatterjee. Some of the noteworthy achievements of IMI New Delhi during the year were also brought to the attention of the attendees. The key milestones attained by the institution includes – the significant growth in the number of Executive PGDM students rising from 26 students last year to 35 candidates to the current year and; placement of 248 students from the campus with an average salary package 12.54 lakhs per annum, with a rise of 4% in salary this year compared to last year. In 2016-17, IMI has successfully trained 659 participants within 859 training days under the Management Development programmes and 173 international participants from 63 countries under the ITEC programme – a scheme of the Ministry of external affairs, Government of India. IMI-New Delhi has also signed an MOU with Power grid Corporation of India for the training of its senior and middle level executives in multiple areas. Sharing his experience, the Guest of Honour Mr. Onkar Singh Kanwar, Chairman and Managing Director, Apollo Tyres Ltd. added, “For me, being an entrepreneur is not all that one usually thinks it is. For me, an entrepreneur should put-in the best of their abilities in what they do, put their passion into everything and do it because one enjoys it. With this, I hope to see all the students becoming successful managers and entrepreneur and extend my best wishes to each one of you”. The event also highlighted the substantial contribution done by the IMI-New Delhi faculty members in the year 2016-17. They have published 73 research papers in highly rated National and International journals. They have also published 6 books, 6 chapters in various books, have presented 34 papers in international conferences, 10 papers in the National conference and 9 case studies. They have also written more 20 articles in National Dailies.